The 2014 profile for Lithuania was incorrectly included in the original version of this report. 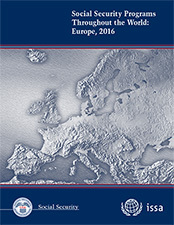 The correct 2016 profile for Lithuania now appears in this report. Previous editions of this report, which date back to 1937, were issued as one volume and were prepared by SSA staff. ISSA has researched and written the publication since the introduction of the four-volume format in 2002, and beginning with the volume on the Americas 2015, the publication is co-financed by both institutions. The ISSA has conducted the research largely through its numerous country-based correspondents, as well as its social security databases and other types of data that are drawn together to update this report. Social Security Programs Throughout the World is based on legislation in effect in January 2016, or the last date for which information has been received by SSA or ISSA. Shea McClanahan and Carlos Galián managed the data collection and analysis for the ISSA, and John Jankowski and Ben Danforth performed a technical review of the report for SSA. Staff of the Office of Information Resources at SSA edited the report and prepared it for publication.